Running from 15-24 September, more than 106,000 visitors joined the Show to celebrate the fun, lifestyle and excitement that being out on the water has to offer. With brand new attractions for 2017, close to 15,000 people got out on the water at the Show, an increase of 50% on previous years, with many experiencing boating for the first time. Set against the stunning backdrop of hundreds of boats lined up along Europe's largest purpose-built marina, visitors were able to hop on and off a stunning array of vessels of all sizes. Murray Ellis, Chief Officer of Boat Shows, British Marine comments: "This year's Show has been a resounding success with an exuberant atmosphere across the 10 days. From our beautiful Tall Ship, Kaskelot, and the Show's free dinghy sailing and Stand Up Paddleboarding sessions to our brand new Paddle River experience, the attractions have proved very popular with visitors. I'm delighted that the Show has offered a platform for thousands of visitors to get out on the water, many for the first time." Murray continues: "There has also been some incredible business done over the course of the Show with one of our larger exhibitors recording the best sales day at any Show they've exhibited at globally. As exhibitors enjoy future business that comes out of this year, the industry looks towards next year's Show, celebrating its 50th anniversary from 14 to 23 September 2018. Speaking about the success of the Show, Richard W Roberts, CEO of TheYachtMarket.com, said: "The Show has exceeded our expectations and has given TheYachtMarket.com a superb platform to both secure our position in the UK and look to new markets overseas like Europe and the USA. We are currently examining the precise figures but suffice to say our brand awareness in our target markets together with actual sales and visits to the website have risen considerably. We were particularly delighted with our portal for new boats, a new product for us, which we chose to launch at the Show and met with a great reaction from the manufacturers, dealers and brokers alike." Murray concludes: "Following on the heels of success here, we look forward to the London Boat Show in January. A celebration of everything you can do on the water, the 2018 London Show has been re-defined and re-imagined, setting it on a course to be better than ever." With global and domestic brands from the likes of Princess Yachts, Sunseeker International, Beneteau, Prestige, Sunsail, Tingdene and Compact Watercraft already signed up, next year's London Boat Show will bring a world of inspiration, on water experiences and exclusive deals. Running from Wednesday 10 January until Sunday 14 January, the Show will welcome two new additions in the Boating & Watersports Holiday Show and Bespoke London. The event will be packed with global, national and boutique brands, first looks, an array of retailers and a unique opportunity to get on the water indoors. Sean Langdon, Managing Director, Discovery Group said: "We are delighted to be finishing TheYachtMarket.com Southampton Boat Show 2017 with confirmed orders of £3million and estimated orders of £3.5 - £4million. We've sold boats across all ranges – Discovery Yachts, Southerly Yachts and Bluewater Yachts – to a range of global buyers." Kiran Haslam, Princess Yachts commented: "It's been a record Show. On Friday (22 September), we had exceeded every previous year whilst the first Saturday (16 September) was the single highest sales day in history at any Show." Sarah Wallbank, Co-Founder of August Race said: "It's our second year exhibiting at TheYachtMarket.com Southampton Boat Show and we have increased our in-show sales by 50% - necessitating a mid-show re-stock from Devon. And the trade enquiries have been just as strong - a particular highlight being when our new Iceland distributor popped over to the Show to say hi. 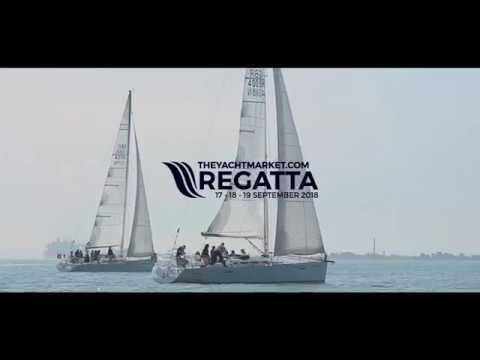 The positivity is palpable throughout the event, reflecting in the strong sales and it's been great to have the motivating presence of Richard Roberts, CEO of TheYachtMarket.com on site. We were proud to support Ladies Day this year and our free August Race sunglasses and prosecco went down a storm! As a result of this year's Show we will be looking to double the size of our stand for the 2018 Show." Mark Sanders, Managing Director at Learn2Sail commented: "This has been our 10th consecutive Southampton Show (a celebration in itself) and we have been delighted with the new changes and layouts that have, in our opinion, improved the quality of the footfall. "We've had a fantastic response to the enquiries that we've taken and sold to new people our concept of Share2Sail, fractional boat ownership. Really looking forward to the London Boat Show and seeing how the proposed changes will help formulate the next generation of boat shows. We are firmly committed to both Shows." Jeff Taylor, Managing Director at Boat Sales International Ltd, remarked: "TheYachtMarket.com Southampton Boat Show is one of the best sales platforms of the year for us. We have been delighted with this year's interest in both our Najad and Moody range of yachts. We are very pleased with the level of sales made during the event and the positive leads going forward." Chris Jeckells, Managing Director at Jeckells the Sailmakers, said: "Having exhibited at TheYachtMarket.com Southampton Boat Show for more years than I can remember, I believe the layout of this year's Show is by far the best. Business has been good and we have met lots of customers, both old and new. We will definitely be back in 2018 and are also looking forward to the revamped London Boat Show in January." Wendy Stowe, Harbour Master at Beaulieu River Buckler's Hard Yacht Harbour, commented: "We have had a really successful Show again this year. It has given us the perfect opportunity to not only meet new customers but to gain feedback from existing berth holders and visitors to the Beaulieu River. "The Beaulieu River Buckler's Hard Yacht Harbour stand has been very busy and we are happy to report that we have exceeded our target expectations. We have already made the commitment to come back again next year." Mathew Hornsby, Sales Director of Williams Jet Tenders, said: "TheYachtMarket.com Southampton Boat Show is always a highlight of the year for us and it has provided a fantastic stage for the UK launch of our two new Sportsjet models. Both the new 345 and 395 models were very well received by visitors during the Show and sales of these models in particular were strong." Chris Fower, Marine Sales and Marketing Manager for Fischer Panda, said: "The Show provides a really great opportunity for our customers to listen to one of our latest generators up close and running. The low noise level really impressed people and proved that on-board power is possible without the sound of a generator negatively affecting their life on the boat. We were really pleased with the level of interest and the general enthusiasm of the visitors to learn more about our latest gen sets." Beryl Chalmers, Publicity Officer for the Cruising Association commented: "This year's TheYachtMarket.com Southampton Boat Show has been our best yet in the 40 years the Cruising Association has taken a stand. We have just signed up our 6,000th member and are the biggest group of cruising boaters in the UK. This year's Show has been very upbeat and positive and the team have all enjoyed it immensely. Alex Diley from Cooney Marine comments: "We've had a great Show this year. The quality of visitor is up on last year and we have seen a 30% increase in our sales from 2016. There's been lots of interest from new customers and we've sold lots of products as a result. We exhibit at the Show to increase our brand presence within the market and it has certainly helped to deliver that." Chris Clayton at Seaward commented: "We were thrilled to launch the world debut of our Seaward Nelson 39 at this year's TheYachtMarket.com Southampton Boat Show. We build bespoke motor yachts for the discerning individual with customised joinery at the factory in Cowes and have had significant interest in our boats over the last 10 days. We've seen much stronger enquiries from this year's Show compared to last and are looking forward to returning in 2018." Steve Hurst, Technical Sales for Brunton Propellers said: "Our brand presence and sales prospects have definitely benefited from exhibiting at the Show this year. I was able to walk around the Show and take it in from a visitors' perspective mid-way through the 10 days and thought what a fantastic day out is was for families in particular." Matthieu Baillorge, Area Sales Manager for Beneteau said: "This is the second year we have had a presence on the marina and have had a great Show with excellent footfall and consistent sales. In the global market, the Show offers a first-rate sales platform and we expect to see further sales in the following two weeks after the event closes." David O'Rourke at Galeon Yachts comments: "As a new brand to the UK, the Show has provided us with good footfall, we have sold boats and leave with over 100 future leads. We came here to simply increase our brand recognition in the UK and leave with successful business being done. We will definitely be returning next year with more boats. Hopefully taking the same location, we look to make this Show an established part of our international boat show calendar as we see it as a valuable platform to benefit from a growing UK market." Karen Potts, Managing Director, Hamble Point Yacht Charters and Principal, Hamble Point Sailing School said: "The new layout of Ocean Hall has worked well for us with a good level of footfall, resulting in more bookings and enquiries than we have achieved in previous years when we have exhibited at the Show. We may need to increase the number of staff manning our stand next year!" Malcolm Stewart, Marine Trade Manager at A-Plan Insurance said: "A brilliant boat show, we exceeded our expectations and targets for the 10 days. TheYachtMarket.com Southampton Boat Show is a fantastic way of communicating with our clients, and prospective clients, face to face. It was hard work but we had a clear and simple goal to spread the word about A-Plan Marine – that goal was achieved. My team are looking forward to next year already to build on the success of this year." Craig McCarthy, MCC Marine said: "We have had fantastic time at TheYachtMarket.com Southampton Boat Show introducing our new Master range of ribs, it has been really great for us to expand our client base and promote brand awareness. It's been MCC Marine's second year here, and we are looking forward to what we can bring to next year's Show already."